Well, the news is mixed on First Lady. We thought that maybe she had a naval infection because her legs were swollen. (Relativity common symptom) Unfortunately the vet took a quick look at her and he feels that when she was sick in her hutch outside she laid close to the outside wall of the hutch for to long with out moving and actually frostbit her hind legs. You can see in the picture above (from today) the swelling near her hoof on her right leg. I am honestly very surprised at this, her hutch had nice deep bedding, and frankly this is the first calf that I can ever remember getting frostbitten like this. Unfortunately prognoses is up in the air for her. The vet says there is a chance she will regain proper circulation in her hoofs, and a chance she won’t. The good news is she is drinking milk and otherwise appears healthy, so that is in her favor. 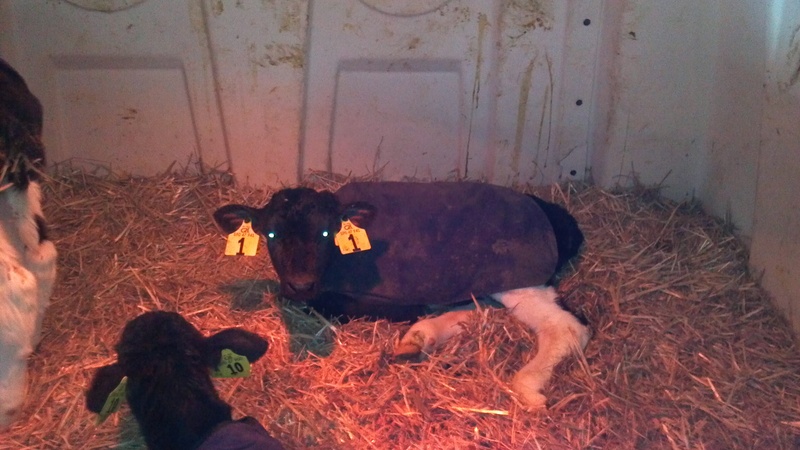 She is currently staying in a hutch with a heat lamp inside to make sure she stays warm. This is the downside to having animals, sometimes they get injured, sick, etc. But we always do our best to prevent sickness, and respond as quickly as possible with the appropriate medication when sickness occurs. I will keep the blog updated on her condition. This entry was posted in Animals, Calf #1, General Information and tagged agriculture, agricuture, agronomy, Animals, baby animals, calf, calf #1, cows, dairy cows, dairy farm, dairy farming, dairy farming today, factory farming, family farm, family farming, farm, farm animals, farmer, farmers, farming, food production, Modern Agricuture, modern farming, organic farming, production agriculture, Production agricuture, sustainable agriculture, sustainable agricuture, Wisconsin dairy farming. Bookmark the permalink.